One hour of supervised play-time. Great for socializing young puppies and allowing older puppies or dogs who are already sociable the opportunity for play dates in a safe environment. You and your dog will learn about canine communication, socialization etiquette, and get to practice obedience skills in real life social situations with the trainers of DOG WILLING. Puppies may enroll up to 5 months old. Older puppies or adult dogs must be evaluated by a trainer for social skills before enrolling. Cost Students: $5/session or $25/one-on-one socialization with a trainer. Please bring payment with you on the day of the session. "Just for Fun" agility focuses on FUN! Fun with jumps, tunnels, tables, A-frame and weave poles. This 6 week class is a great start if you are not sure about your level of commitment to agility or your dog's suitability for the sport. For puppies that graduated from a puppy class This is our 8-week curriculum designed for dogs older than 6 months old who have already graduated from a puppy class. This course focuses on reinforcing the puppy behaviors already learned to make sure they stick. We work on increasing the duration of behaviors like sit and stay and we increase the distance your dog will perform skills such as sit, down, come, stay, walk nicely, stand and leave it. You will really be able to impress your friends and family with your polite and well-mannered four legged family member. Classes are incredibly fun for you and your dog and help increase the bond you share. Register today before it's too late. Get your puppy off to the best start possible. Dog Behavior experts agree, proper puppy socialization is essential to the development of your dog and can prevent many future problems. Our 1-hour FREE Puppy class is for dogs less than 6 months old and will keep you in stitches watching your puppy interact with its classmates. Be sure to bring your camera. You will also see how much fun dog training is as your pup learns critical new skills through play. The class is full of games and exercises plus you will establish some important dog training skills to build on. Space is limited so register today before it's too late! For teen dogs that missed puppy training You may wake up one day to discover that your wonderful, cuddly puppy has turned into a teenage monster, especially if it missed our puppy socialization class. This 8-week curriculum is designed for dogs ranging from 6 to 8 months old that missed the opportunity to attend a puppy class. This is a perfect course for your teen dog that has no obedience, no manners around people and doesn't play well with other dogs. Lessons are fun for both you and your dog. 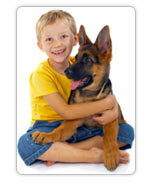 By using games in the learning process we help you teach your dog to be a well-mannered family member. Secure your reservation today before your teen-dog drives you nuts! Taught by an AKC approved CGC Evaluator, this is an exciting program designed to get you and your puppy off to the best start. We could all use a little help with our manners, right? Our 6-week puppy class for dogs less than 6 months old covers the essentials of family life, housetraining, crate training, puppy biting, basic leash skills and simple obedience cues like sit, down, come, stay, no jumping and watch me. The classes are fun and help build your pup's confidence while socializing it to different dogs and people. We incorporate games and lots of fun into these classes. When completed, your puppy will be eligible for the AKC S.T.A.R. Puppy® Program. Be proud of your well-mannered furry family member, call to reserve your spot today!